In 1983, the Bell Boeing tiltrotor team was selected to develop their tiltrotor concept into the V-22. It is powered by two Rolls-Royce T406-AD-400 engines which drive 38 ft (11.6 m) three-blade rotors on a 45 ft (13.7 m) wingspan. The aircraft maximum Short Take-Off gross weight is 60,500 lb (27.4 metric tons) and it can fly at more than 250 knots (460 km/h), carrying up to 24 troops or an internal payload of 20,000 lb (9.1 metric tons). 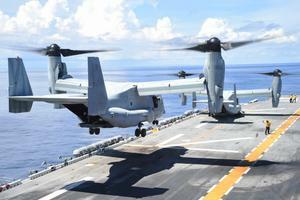 The Bell Boeing V-22 Osprey is the first tiltrotor to enter production and be used operationally. The aircraft can trace its lineage to prior two Bell demonstrator’s products, the XV-3 and XV-15. The aircraft flew for the first time on March 19, 1989. Since then, it has evolved into a reliable and essential component of US military — the Osprey had a long and challenging development history, but over time this capable machine has lived up to its original expectations. Today, the V-22 is being used by the U.S. Air Force, the U.S. Navy, and the U.S. Marine Corps, with Japan also having ordered the Osprey. The V-22 Osprey has been continuously deployed since entering service in 2007 and, in November 2018, the fleet surpassed the 400,000-flight hour milestone. Resources related to the V-22A Osprey, provided by the Vertical Flight Society. 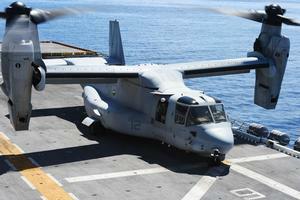 Resources related to the V-22A Osprey, provided by public sources across the internet.